Michele Alboreto extended his lead over Alain Prost in the drivers' championship to five points with victory at the German Grand Prix. Alboreto's second win of the season was made easier when Prost slid off the track nine laps from the end. Qualifying threw up one of the season's biggest surprises when Teo Fabi took pole position in his Toleman. It was the highlight of a year in which he only finished two of the 13 races entered and was to be the only pole of his career. In the event he did not capitalise on his hard work and was immediately relegated to fifth after wheelspin on the line. Ayrton Senna got away quickest to lead from the third row while the Ferraris of Johansson and Alboreto collided at the first corner. Alboreto went for a gap and as Johansson turned into the corner, contact was made. Alboreto's front wing sliced Johansson's rear tyre and caused the Swede to pit. Keke Rosberg passed Senna halfway through the opening lap but Senna regained the lead on lap 16, staying in front until a broken drive-shaft joint caused his third successive retirement ten laps later. The reliability issues faced by Lotus were underlined when Elio de Angelis' car expired in a cloud of smoke. Rosberg regained the lead but was being hunted down by Alboreto. Under pressure, Rosberg slid wide at the Veedol corner and Alboreto moved to pass but the pair banged wheels. Alboreto passed but Rosberg was forced even wider and that allowed Prost through as well. 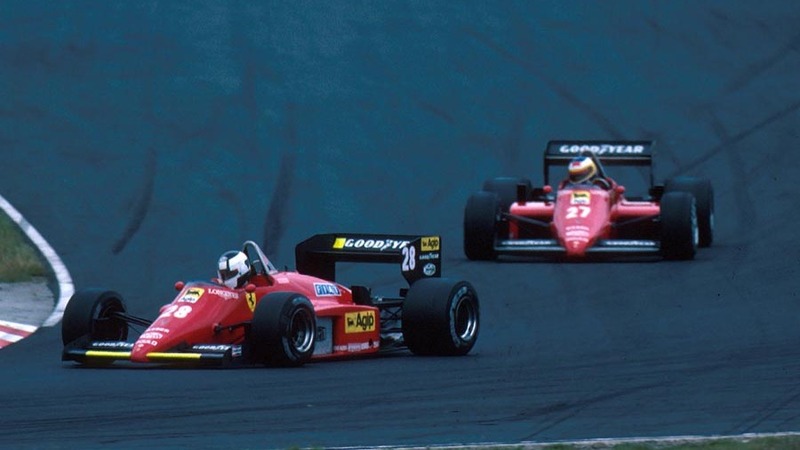 Alboreto's win saw him open up a five-point margin on Prost in the drivers' championship. Rosberg eventually retired when he lost his rear brakes and Johansson was heading for the podium when he lost his brakes, too, and spun off. That gifted third to Jacques Laffite in a Ligier who had emerged ahead in a gripping tussle with Nigel Mansell - who said it was "a terrific scrap" - which only ended when Mansell's Williams lost power five laps from home. Fabi, meanwhile, finished the day on the side of the track after his engine cut out and then cut in again so suddenly it wrecked the transmission. This proved to be the last race for Manfred Winkelhock, who retired due to engine issues, as he was tragically killed during an endurance race in Canada just eight days later.